Bolder colors, floral flourishes, heightened eco-friendliness and textures all around—these are just a few trends to look for in the coming year. It’s almost 2019. Out with the old, in with the new—which means that every decorating choice you made in 2018 is now obsolete, right? No, not at all. Decorating trends are an evolution, not a revolution. Everything that was big in 2018 or 2017 is still here in some form, but there are subtle changes being incorporated into decorating trends that take 2019 in a slightly different direction than what we’ve seen before. It’s a mix of the old with the new, and as such, it can reinvent your décor into something fresh and exciting. Incorporating the best of the past with the innovation of the future, here are the big decorating trends to look for in 2019. Are grays still in? Absolutely, but now we’re seeing an emergence of colors to suggest that the dominance of grays may be waning just a bit. 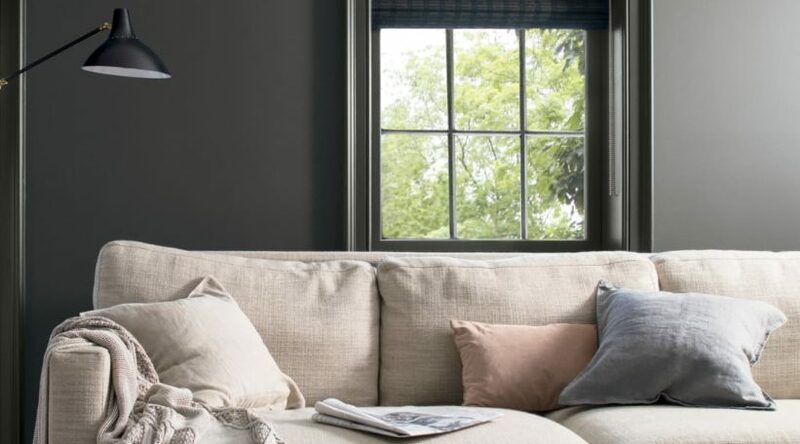 You need look no further than 2019 Colors of the Year from major paint manufacturers to see the trend emerge. As an example, there is PPG paint brand’s Night Watch, a rich, luxurious and classic shade of green that resembles the deep green hues found in forests. This is a two-for-one trend, as Night Watch also embodies a trend toward eco-friendliness based on the feeling of lush greenery and the restorative power we feel in nature. Kelly-Moore Paints has bestowed Color of the Year honors on Peacock Blue, a classic blue with green undertones. In making the announcement, the company notes that Peacock Blue and saturated blues are a must for textiles and home goods but also can be an interesting choice for walls by adding depth and drama. From Pratt & Lambert comes another bold choice for Color of the Year—Earthen Trail, combining the calming, elegant feel of a soft terracotta but with a personality that is reminiscent of sherbet, making it the perfect hue to combine with bolder colors, patterns and shapes in every room of the house. But not so fast—gray will remain as one of the major color trends for 2019. Showing the continuing influence of gray, Benjamin Moore is highlighting Metropolitan as its Color of the Year. A silvery gray that adapts well to its surroundings, the hue can provide the feel of a cozy sanctuary when used in a soft matte finish or a glamorous setting when used in a sheen. Versatility is the hallmark of Metropolitan, making you feel at home regardless of your personal style. The question isn’t whether florals are back but if they’ve ever really gone away. Florals are a theme in wallpaper, area rugs, upholstery, drapery and bedding. What makes them so desirable is their versatility and ability to fit into any decorating style. Of course, florals are a staple of traditional decorating. But when used in unique colorways or stylized expressions, they can be equally at home in a modern décor. Large-scale florals are an especially bold way to make a statement, and in a colorway favoring blacks, silvers or pearlized whites, they can look fresh, cutting-edge and amazing. Eco-friendly decorating is not so much a trend as a conscious lifestyle choice. It’s not something that goes “in” and “out” like earth tones or sponge painting. Eco-friendly decorating, first of all, means making conscientious choices such as using low- or no-VOC paints; reclaiming materials rather than throwing them away; and using biophilic design principles to take advantage of natural light, fresh air and natural materials such as wood and stone. There are also environmentally inspired decorating choices that you can use in your home, including natural products such as bamboo, grasscloth, cork or wood; color selections that are reminiscent of nature—i.e., forest and sage greens, terra cottas, sandstone, turquoise blues and mineral-inspired hues; and floral or nature-inspired themes in wallpaper, wall murals, bedding, upholstery and other decorating products. Texture has always been an important staple of home decorating, and it shows no sign of subsiding in 2019. Texture is a way to add warmth, visual interest and unique elements to your room’s décor. Grasscloth, for instance, adds texture while also adhering to the eco-friendliness trend. The enduring appeal of decorating paint is built on the concept of texture. Venetian plasters add warmth, elegance and sophistication to a room that is far more appealing than a smooth surface wall. If you’re nervous about going too bold with color, texture is a way to add an element to a room that will have a subtle but unmistakable impact. Use texture in artwork, ceiling treatments, accessories such as pillows and area rugs, in window treatments and furniture pieces, and suddenly your room exudes a lot more character and distinction. These four trends are early contenders for making 2019 a distinctive year of color and design. Additional trends will emerge as the coming year—like every year before it—writes its own unique chapter in the continuing evolution of home decorating trends.